I’ve met someone who grants wishes—really! Petite and delicate, Suzie Mousseau is light on her feet, which are shod in spangled espadrilles. Her dark eyes are bright and laughing, and serpentine wisps of hair escape her up-do to dance about her shoulders. 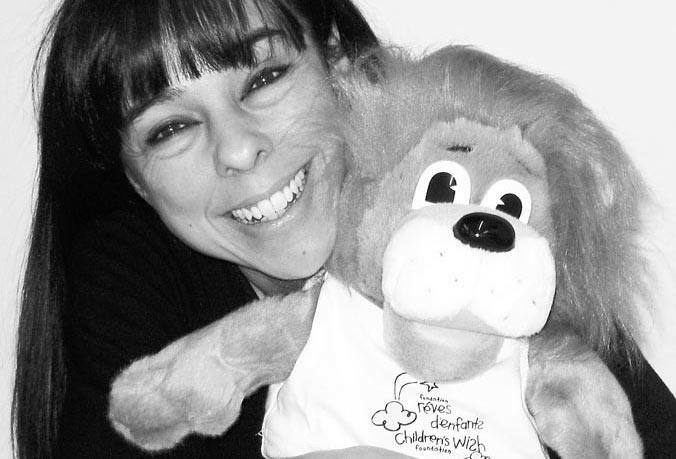 I think to myself that she’s exactly what you might expect a person to look like after 20 years of making wishes come true for the Quebec chapter of the Children’s Wish Foundation. Here’s a closeup of the wonder woman who’s half impish pixie, half Tinker Bell. I imagine that some days aren’t as happy. I was supposed to meet Suzie three weeks earlier, but she had to cancel because she needed to attend to wishes made by three children in the final stages of illness. At moments like those, she knows it will be the last time she sees them. How did you become a wish coordinator? S.M. Oh, it’s not much of a story! I was working as an event organizer, staging gala events, but I knew it wasn’t long term. When the Foundation advertised for a coordinator, I applied. Why did you get the job? S.M. I thought it was because of my background in social work—but it wasn’t. They hired me because I was already volunteering to organize charity activities. So let’s say the combination of my experience and my attitude helped me land the job. From the glamorous world of special events to a charitable foundation. Do you ever regret your decision? S.M. Never! The salary wasn’t the same, but I was young and had no children at the time, so I was able to make the sacrifice. I’ve never gotten so much satisfaction from my work as I do here. The first call I made went like a dream. I quickly realized what a difference I could make. A gala dinner or meal with a hockey player, all they require is organization. But that brief moment when a child’s wish is granted brings such joy all around, everyone involved gets so much from it. Are all wishes that easy to grant? S.M. The ones that are the most challenging to coordinate aren’t the most outrageous. What makes them complex is the child’s physical condition, and what medical equipment has to be on hand. In any case, the last week before a wish is carried out is crazy—for sure! So I shut my door. I have to really focus; I can’t overlook any details. My colleagues know to leave me alone. I can’t do anything that will impact the Foundation’s reputation. What’s the most popular wish? S.M. To travel! Especially to Disney World, and that’s normal. These are kids, Orlando is a magical place, and they’re really well organized. Families return home transformed, with memories of the moments they shared together. And when one child has a severe illness, brothers and sisters are affected too, so kids are happy when their wishes benefit everyone. What was the most outrageous wish? S.M. The first trip to Bora Bora. Thanks to the reality show Occupation Double—where the couples were shown on the island—more and more teenagers were naming Bora Bora as their wish. At first we had to find the right people, figure out the travel, and all that. So now I’m the “Queen of Bora Bora.” When chapters in other provinces are asked to grant that wish, they call me. Do you have to develop a thicker skin? S.M. No, we don’t—and I don’t want to. I would lose my sensitivity and ability to listen, which are the key to doing my job well. So often people say to me, “you’re so grounded.” But I’m not grounded, I’m focused! You have to be fairly sensitive—maybe a little crazy—to do this. But I keep doing it because I won’t let illness stop us. Children’s wishes, that’s not illness, it’s magic! I just want to make their wishes come true and have a good time doing it. At Blue Cross, when we receive copies of thank you notes from the families, we notice that they’re often addressed directly to you. “Not much of a story,” she said. Suzie Mousseau is anything but unremarkable. I thank her for her time and she walks me out, not surprised that I give her a hug instead of a handshake. It’s not every day you meet someone who grants wishes—and I’m the better for it. Blue Cross generously insures families travelling with the Children’s Wish Foundation, and waives pre-existing conditions for sick children during such trips. In this season of sharing, you can join Blue Cross in donating to the Children’s Wish Foundation.